Is there anyone who isn’t fascinated by astronomy? My kids admittedly have a hard time wrapping their heads around the enormity of space and will ask questions like, “What’s bigger…Jupiter or California?” However, they love talking about planets and learning whatever I’m willing to teach them. 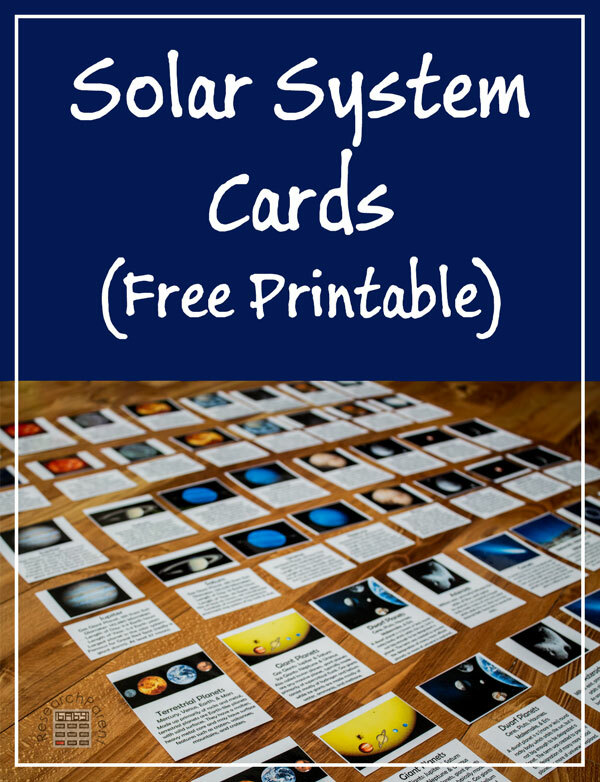 NASA’s awesome new pictures of Pluto prompted me to make these free, printable solar system cards. 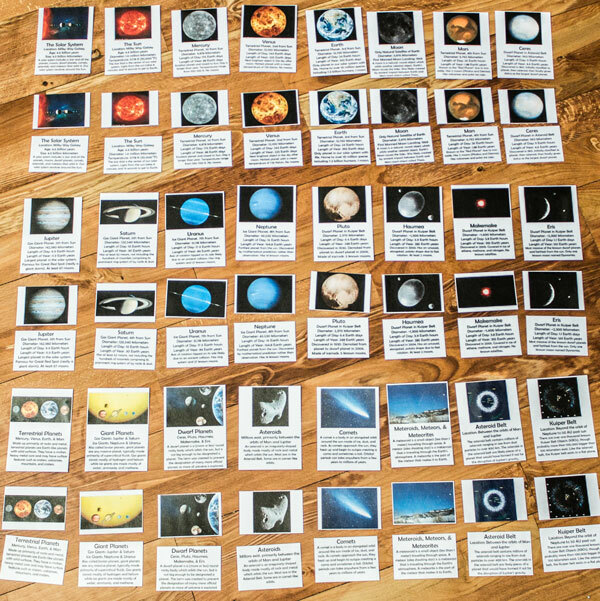 These space cards are in the Montessori 3-part nomenclature card style, but I included extra information on each one to make them a little more like trading cards. 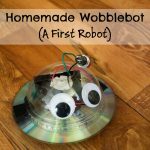 I was planning to save them as an independent activity for when my 5 and half year old was a bit older, so I was surprised when all of my kids wanted to play with them right away. My baby mostly just wanted to chew on them, but they’re laminated, so it was okay. My 5 and half year old used the control cards to figure out how to match the picture and information cards. He’s starting to read and was motivated enough to try and read each label on his own. I was especially surprised that my 3 year old found her own way to “play” as well. She essentially invented the job of helping her brother make pairs by matching just the picture cards to the control cards. 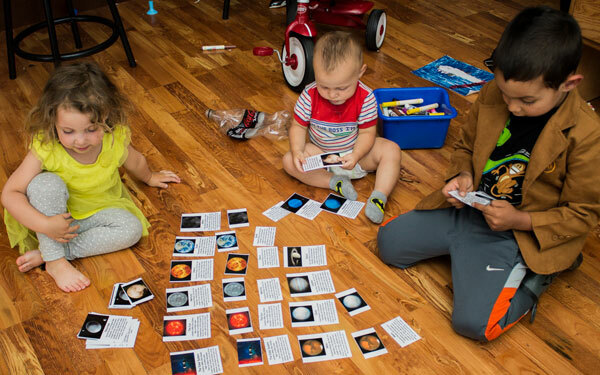 If you’re looking for a book to go along with these solar system cards, I recommend Comets, Stars, the Moon, and Mars: Space Poems and Paintings by Douglas Florian (affiliate link). Since the cards themselves contain so many facts, I think the creativity in this book is a nice balance. The book contains a wide variety of poem styles, all of which my 5 and a half year old and I enjoyed. (Our favorite was the one about poor Pluto.) We checked this book out from the library, but we liked it so much I’m sure I’ll add it to our collection eventually. 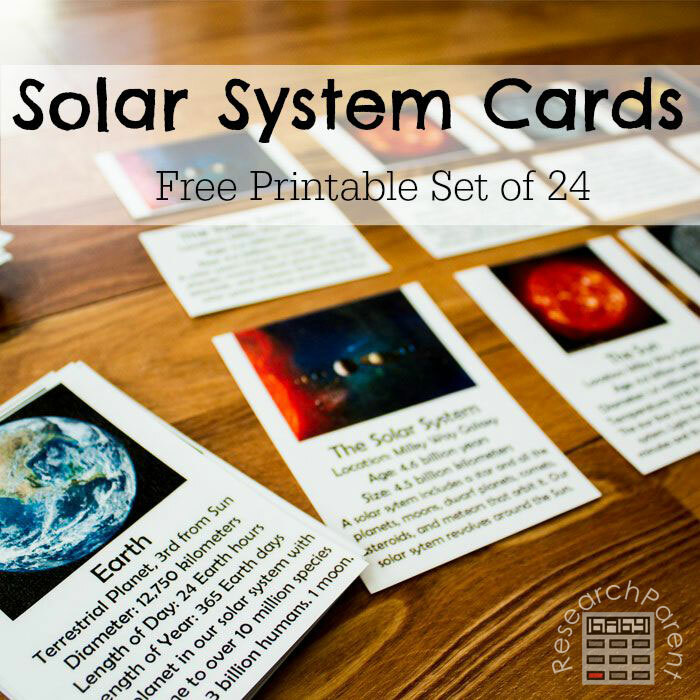 If you like these cards, be sure to check out the rest of my Astronomy posts. Eventually, I hope to make cards on space exploration (going back to Copernicus and Galileo and including modern terms like space shuttle and international space station). Sign up for my newsletter to be notified when new freebies become available. Cut out the laminated cards. 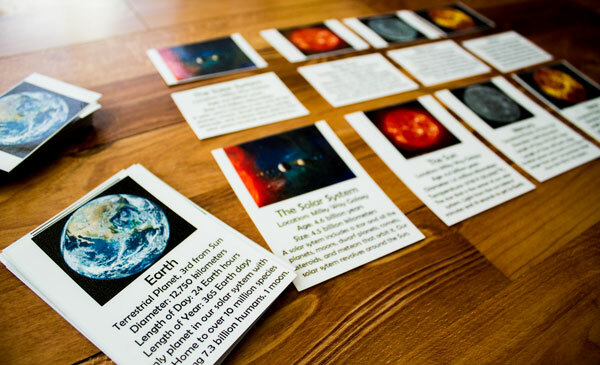 In addition to using these cards as a self-correcting, independent activity, they can also be used for a multi-player memory-style, matching game. 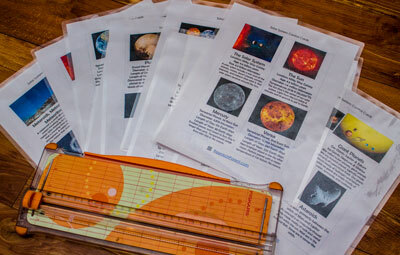 Click here for more Astronomy activities for kids. I’m glad! And it’s no problem. I love making stuff like this. I learn so much in the process. 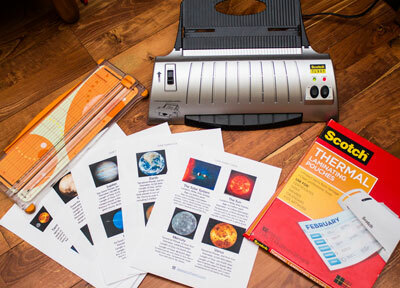 I seriously don’t know what I’d do without my laminator. I’ve had to start buying the 200 pack. These are fabulous. These will be wonderful to have in my classroom for science station or as a free explore option. Thank you! Thank you! I’m so glad you can use them! Wow! Very good! Can I print these and give as a birthday party packs to my son & his classmates? I think they will love it. Of course! I would be honored to have you share them. Let me know if you have any trouble. Thanks so much! Your works are awesome! You’re so sweet! I’m glad you like my cards. I hope they’re helpful to you. My 5 year old daughter enjoys matching and sequencing them while singing the 8 planets song. Next in line is the Ancient Egyptian Cards for our history and geography. Thanks for generously sharing your talent and beautiful works. Hi Glenda! 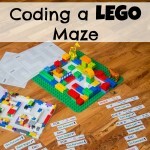 I would love to be able to help and I’ve had similar ideas. I’ve already made Ancient Egyptian Monument Cards which can really just be considered current Egyptian landmarks, since all the monuments are still standing. (If you’re interested in Egyptian history as well, I’ve also made cards relating to Ancient Egyptian vocabulary and famous Ancient Egyptians.) Unfortunately, Egypt is really the only country I’ve focused on so far, though since I’m looking from the perspective of ancient history, I have Ancient Mesopotamia definitions coming soon. I’ve been thinking about making “country cards” to go along with our Little Passports subscription, which would include terms, landmarks, and famous people for each country. The first 3 countries in that subscription are Brazil, Japan, and France. If you have other specific country ideas let me know. I have a baby due in June, so after that I probably won’t be able to make new learning tools for a few months. Take care! I love these! I don’t normally comment on anything but I had to say that these are going to work perfectly for my space unit. As a Montessori teacher they are wonderful with the beautiful images! Thank you! Thank you so much! It makes me really happy to hear that. 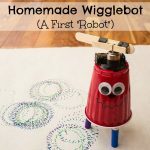 HI Michelle, thank you so much for the printable, very useful for my kids. Thank you for including Pluto in this set – I wish it were in the “Relative Size of The Planets” set as well. I’m so glad! Thank you for letting me know. Definitely the highlight of my morning.